Good afternoon! So I'm sitting here, in my brand new studio, watching some horrible Jeff Goldblum/Silverstone movie and studding my new jean shorts away. I bought these jeans at American Eagle last week because they were really cheap. They fit me well but I felt like the faded denim+shortness combination was a little too... young? I guess. The point is, they were cheap and fit me well so why not get them, right? Seeing as I'm a costume design student, I figured I could use some of my studding skills and attack fashion. Though I don't own a whole lot of studded things (actually only one blazer with studded lapels), I LOVE studded things when they are done right and more rock-like. 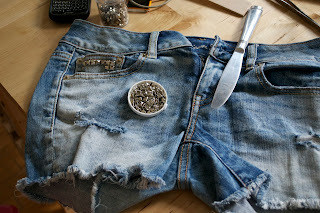 No matter how much I love studs though, studs are terrifying... If you are my age, you might remember the birth of the 'emo'-look when it was mixed in with early 2000's skater look. Remember rainbow coloured studded belts? Enough said. I totally agree with you!! 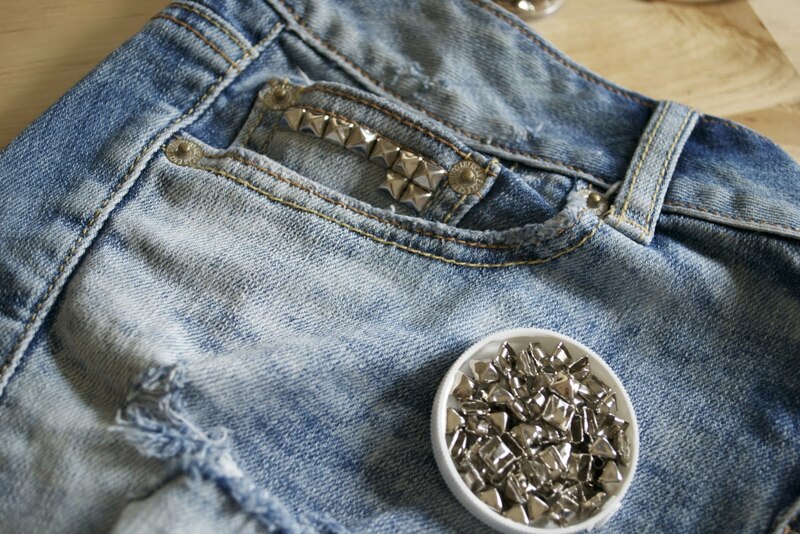 I love fixing up old clothes like this and making them new. Not only does it create something completely new and unique but I love wearing clothes that have a life to them. studs are so cool...if they are used properly that is. They add personality to anything you do!